Wait! 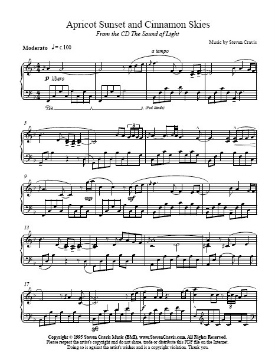 You could get this as part of the 11 pieces sheet music bundle HERE and get all 11 PDF sheet music titles for only $28.45. That's a $15 savings compared to buying all 11 separately. 5 page PDF sheet music by Steven Cravis, from his CD The Sound of Light. Intermediate level, Key of F Major. And the audio for Steven Cravis piano music can also be purchased at iTunes.